The uglying-up of the nation’s capital in the name of security and terrorism-prevention can be traced to 20 years ago this week when, without warning, a two-block section of Pennsylvania Avenue nearest the White House was abruptly closed to vehicular traffic. The move was taken early on May 20, 1995, a month after of the deadly truck bombing at Oklahoma City in April 1995; it was intended to thwart other, would-be terrorists from targeting the White House. Resistance to the sudden move was vigorous but ineffectual. To this day, that stretch of Pennsylvania Avenue is off-limits to vehicles (except for police vans and the like); it bears the look of a closed-off street masquerading as a pedestrian mall. A barrier-studded, uninviting pedestrian mall (see photo). Closing sections of Pennsylvania Avenue — America’s Main Street, as it’s sometimes called — was, I write in my latest book, 1995: The Year Future Began, emblematic of a nascent, yet powerful, “security-first mindset” that emphasized precaution and gained ascendancy after the attack at Oklahoma City. The bombing, which killed 168 people and injured more than 600 others, was, I write, “a turning point in domestic security and security precautions for Americans.” The attack helped to mold the now-familiar, hyper-cautious, security-first mindset — a psychology of fear that has found expression in a variety of restrictive measures aimed at warding off a terrorist attack. The case of Pennsylvania Avenue signaled the emergence of the capital as bunker, I also note in 1995. Several streets near the Capitol were similarly closed to vehicular traffic in the summer of 1995. 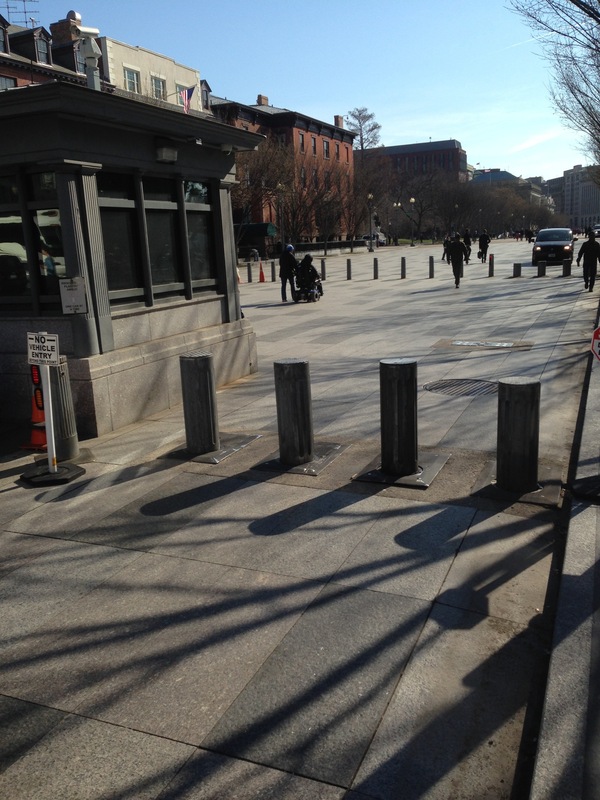 Concrete planters and Jersey barriers went up near government buildings in Washington and beyond. “An architecture of defensiveness became plainly visible in the capital, and its trappings—the barriers and the steel gates—have lent a shabby look to the avenues in the heart of Washington,” I write in 1995. It’s a bleak and disheartening look that can be traced to 1995. Cutting off Pennsylvania Avenue set off an intense debate in which the Post figured fairly prominently. Clinton, for his part, likened blocking off a portion of Pennsylvania Avenue to installing metal detectors at airports, saying was “a responsible security step necessary to preserve our freedom, not part of a long-term restriction of our freedom,” the New York Times reported. Interestingly, the move had the effect of making the Executive Mansion seem more fortresslike, and the president seem even more remote, “more deeply ensconced within a security cocoon,” I write in 1995. Not only that, but closing the stretch of Pennsylvania Avenue nearest the White House arguably did not make the president’s mansion all the more safe. Just three days after the traffic-blocking barriers went up on Pennsylvania Avenue, a 37-year-old man carrying an unloaded handgun scaled an eight-foot fence at the White House,raced across the lawn before he encountered Secret Service officers. He scuffled with one of them and was being shot, wounded, and subdued. The intruder was identified as Leland William Modjeski, a former pizza deliveryman who once was a PhD. student in psychology. This entry was posted on May 18, 2015 by W. Joseph Campbell in 1990s, Oklahoma City bombing, Terrorism, Watershed year and tagged "uglying up", 1995, Clinton, Pennsylvania Avenue, Terrorism, Watershed year, White House.